Our stories shape the world around us, a world that is diverse and complex. Banned Books Week is a time to celebrate, preserve, and fight for freedom to tell our stories and to fight against banning books and silencing stories. Censoring our stories is, essentially, censoring our world: denying a perspective is denying the richness of our human experience. Right now especially, culture needs all of our voices, all of our stories. And you have the power to make sure information and stories are heard. It’s simple: read, process, and share your insights. "Often the most frequently challenged books, are the stories that need to be heard the most." Listening to stories (reading books) can help us glean not just perspective, but also context. Master storyteller John Green recognizes that “text is meaningless without context” in his video response to the banning of his 2005 novel Looking for Alaska (LibraryBorrow/IndieBuy). Speak Out: Everyone can get involved: support and advocate for free speech and expression, or report challenges and injustices. 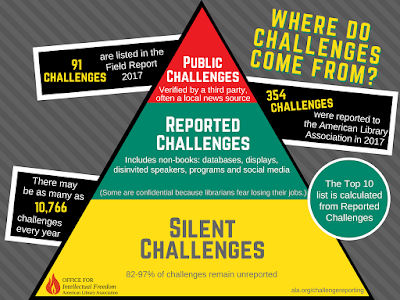 The American Library Association (ALA) created this handy pyramid chart of public, reported, and silent challenges. It's discouraging that so many challenges go unreported, but don’t let the data get you down, you can do something. 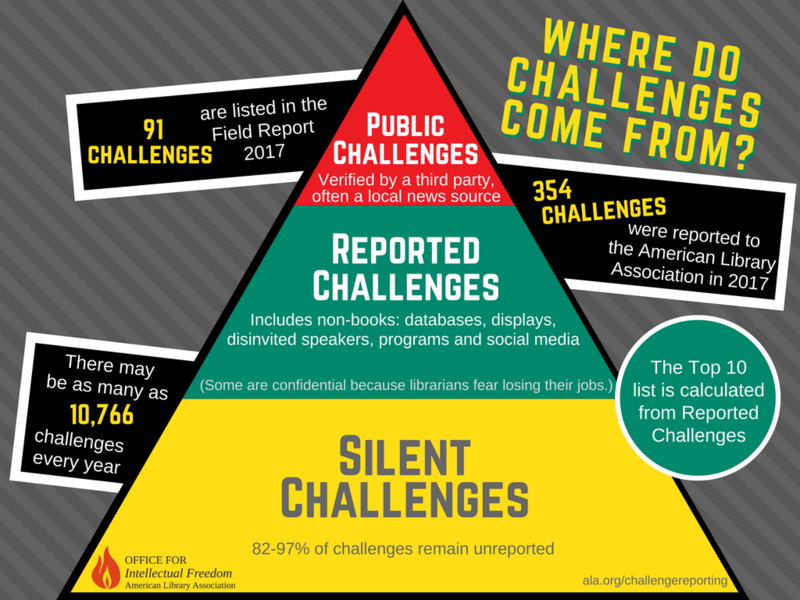 Use the ALA Challenge Reporting page, become a champion for challenged books. And if all this information got you as fired up as us, take a second to share on social media or why not use the old-fashioned way: word of mouth. Start a converstion about why you think your favorite banned book is an important read. And ask people in your community to do the same. If you post on social media, use the hashtag #BannedBooksWeek. Give us a shout out, we're on twitter @BooksforWalls. For a little fun, check out New York Public Library's Banned Books Quiz, test your knowledge of challenged books.